Seaweed as a staple item of diet has been used in Japan, Korea and China since prehistoric times. In 600 BC, Sze Teu wrote in China, "Some algae are a delicacy fit for the most honoured guests, even for the King himself." Some 21 species are used in everyday cookery in Japan, six of them since the 8th century. Seaweed (kaiso) accounted for more than 10% of the Japanese diet until relatively recently, and seaweed consumption reached an average of 3.5 kg per household in 1973, a 20% increase in 10 years (Indergaard 1983). The most important food species in Japan are Nori (Porphyra species), Kombu (Laminaria and Saccharina species), and Wakame (Undaria pinnatifida). In the west, seaweed is largely regarded as a health food and, while there has been an upsurge of interest in seaweed as food in the last 20 years, it is unlikely that seaweed consumption there will ever be more than a fraction of the Japanese. Regulations for the gathering of Palmaria palmata (dulse, dillisk), a red seaweed, are mentioned in the Icelandic sagas of the 10th century. This edible seaweed has been used also in Ireland and Scotland for an evenlong time. Today, dulse is becoming popular again in Ireland and in the USA. More information of the history of dulse can be found here. Laver (Porphyra) has been eaten in Wales since at least A.D. 1600 (see below). Chondrus crispus (Irish Moss) was recommended as a health remedy in Ireland at the beginning of the 19th century (Mitchell & Guiry 1983), but its use would appear to be unknown before this. Various red algae have been used in the Mediterranean as sources of dying agents and as anthelmintic and other health remedies since pre-Christian times (Stein & Borden 1984). The use of kelps (kombu in Japan; kunbu or haidai in China) dates back to at least the 5th century in China (Tseng 1981a, 1981b). The main species used is Saccharina japonica (Laminariales), but 8-11 other species are also used, mainly in Japan. Plants are dried after harvesting and either cut into strips or powdered. 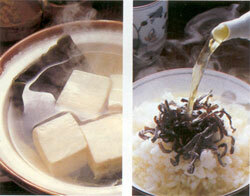 In Japan, kombu is used in the preparation of fish, meat dishes, soups and also as a vegetable with rice. Powdered kombu is employed either in sauces and soups or is added to rice in the same way as curry. It can also be included when cooking beans to add nutrients and improve their digestibility. It is also a rich source of glutamic acid, a natural substitute for monosodium glutamate and a flavour-enhancer. Some kinds are used in making an infusion similar to tea. Kombu is also important in Korean and Chinese cuisines. 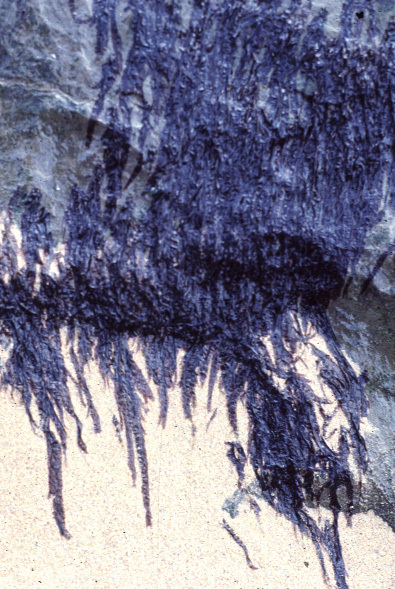 In 1976, about 176,000 wet tonnes of Laminaria spp. were collected from wild sources in Japan and about 22,000 t were cultivated. Laminaria is cultivated either by seeding blasted areas of rocky shores or by seeding ropes. In China, Saccharina japonica (formerly Laminaria japonica) was imported from Japan from the 5th century until the founding of the People's Republic. In the early 1950s, the Chinese started to cultivate this species, which had been accidentally introduced from Japan to Dalian on the Yellow Sea. Today, about 6 million tonnes wet weight of this kelp are grown in China. 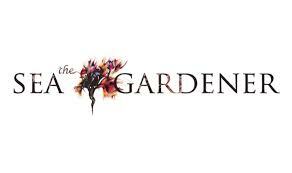 The strains grown may represent more than a single species. Another kelp, Undaria pinnatifida (Laminariales), is widely used in Japan (where it is known as "Wakame") and China ("qundai-cai") as food. In Japan this species is a more important crop than Laminaria both in value and production (Tseng 1981b). Natural production increases were achieved for many years by placing stones on the sea bottom and blasting rocky reefs to increase the area suitable for attachment. Artificial seeding is carried out on cleared areas using either zoospore suspensions or sporophylls (specialised leaflets which bear the zoosporangia). Annual production from natural habitats in 1960-69 was 40-60,000 wet tonnes. Rope cultivation has been carried out since 1955 and the ropes are seeded by attaching sporophylls. Hybrids with superior growth and nutritional characteristics have been developed in Japan. In 1976, about 20,000 wet t were collected from wild sources and 127,000 wet t were cultivated. The harvested algae are dried after washing in freshwater. After resoaking the plant material is used as an additive to soups (wakame soup is served with virtually every meal in Japan); toasted (Yaki-wakame); used half resoaked, with boiled rice; and coated in sugar and tinned (Ito-wakame).In China, Undaria pinnatifida was collected from natural habitats for centuries, mainly on the East China Sea coast. Plants are grown now on ropes in the Quingdao and Dalian areas (Yellow Sea), to where the algae were transplanted from Korea and, perhaps, Japan (Tseng 1982). Undaria is not as popular as Laminaria in China as a foodstuff and the growers find the plants difficult to manage. The annual production in China is, therefore, very low, amounting to no more than a few hundred tonnes in dry weight each year. Wakame is most often used in soups such as miso soup or in sunomono salads. Studies conducted at Hokkaido University have found that fucoxanthin in wakame can help burn fatty tissue. Studies in mice have shown that fucoxanthin induces expression of the fat-burning protein UCP1 that accumulates in fat tissue around the internal organs. Expression of UCP1 protein was significantly increased in mice fed fucoxanthin. Nori (Japanese), known in Chinese as haidai and in Korea as kim or gim, is now an almost universal name in nutrition for various edible seaweed species of the red alga Porphyra including most notably P. yezoensis and P. tenera. Since the 17th century Japanese fishermen have planted either bamboo or brushwood ("hibi") in shallow waters to increase the substratum for nori. The hibi were placed in rocky areas in the autumn where the Porphyra spores settled and were then moved to sandy areas for the growth of the leafy plants in the winter. The discovery, in 1949, of the filamentous Conchocelis-phase in the life history of Porphyra umbilicalis by the British phycologist, Kathleen Drew (Drew, 1949), led to the seeding of ropes from artificially-cultivated Conchocelis-phases. In 1977, some 300,000 t wet weight of Porphyra spp. were harvested in Japan and the production volume increased by 25% per annum in the 1970s. Nori is sold in sheets that may be toasted to give a green colour and then flaked and added to sauces, soups and broths. Sometimes it is just soaked and eaten. 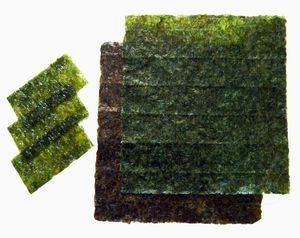 Small, dry nori sheets are used to wrap cold rice balls, which make a popular lunch-time snack for Japanese children. The food value of nori lies in its high protein content (25-35% of dry weight), vitamins and mineral salts, especially iodine. Its vitamin C content is about 1.5 times that of oranges and 75% of the protein and carbohydrates are digestible by humans, which is very high for seaweeds. Nori sheets (right) are used in many sushi dishes, for rice balls and as a topping or condiment for various noodle and other dishes. Laverbread (mostly Porphyra dioica) is picked on the coast of Wales from intertidal rocks and is known in Welsh as 'bara lawr'. It has an excellent nutritional content, mainly protein, some carbohydrate, vitamins A, B, B2 and C and lots of trace elements and minerals, the most prominent of which is iodine. Another plus is that it islow in calories and very suitable for vegetarians of all kinds. Walk into any health shop in Wales and you will find it in tablet form or tinned. When the seaweed arrives at the Welsh factories, it is inspected and goes through a series of washes. It is then cooked for several hours with only a little salt added; this produces a very dark, dense spinach-like purée. You can buy laverbread online here. Many chefs are discovering the culinary assets of laverbread, adding new dimensions to their repertoires. Traditionally, it has been enjoyed very simply spread on thin toast with oatmeal or malted vinegar, and accompanied by fried or grilled Welsh-cured bacon. More recently it has been served with pasta dishes, in spicy batter with mushrooms, and seafood pizzas. There is now renewed interest in western countries in the use of seaweeds as sea vegetables. 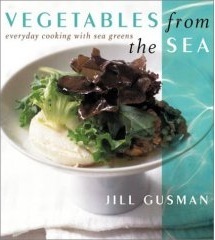 Vegetables from the Sea: Everyday Cooking with Sea Greens by Jill Gusman (2003), available from Amazon is an excellent start, and there are many other such books appearing all the time. The Forager's Kitchen by Fiona Bird is an wonderful source of information for the forager of natural foods. Its Chapter 5, Sea and Shore, includes some seaweed recipes. Drew, K.M. (1949). Conchocelis-phase in the life-history of Porphyra umbilicalis (L.) Kütz. Nature, London 166: 748-749. Guiry, M.D. (1989). Uses and cultivation of seaweeds. In Alghe e loro Utilizzatione Convegno Nazionale. (Anon., editors), 21-56. Camera di Commercio Industria Artigiantoe Agricoltura; Universit? Degli Studi, Lecce. Guiry, M.D. & Blunden, G. (1991). Seaweed resources in Europe: uses and potential. pp. xi + 432. John Wiley & Sons, Chichester (currently out of print and very expensive on the second-hand market). Guiry, M.D. & Hession, C. (1996). Seaweed. In Science, Technology and Realism in Environmentally Friendly Development. Proceedings of the Conference Blueprint for the 21st Century held in the Royal Dublin Society 20-21 October 1994. (Moriarty, C., McCloskey, B. & Power, C., editors), 121-128. Royal Dublin Society Seminar Proceedings, Dublin. Guiry, M.D. & Hession, C.C. (1998). The seaweed resources of Ireland. In Seaweed Resources of the World. (Critchley, A. T. & Ohno, M., editors), 210-216. Japan International Cooperation Agency, Yokosuka, Japan. Mitchell, M.E. & Guiry, M.D. (1983). Carrageen: a local habitation or a name? J. Ethnopharmacol., 9: 347-351. Indergaard, M. & Minsaas, J. (1991). Animal and human nutrition. In Seaweed Resources in Europe: Uses and Potential. (Guiry, M. D. & Blunden, G., editors), 21-64. John Wiley & Sons, Chichester. Lembi, C.A. & Waaland, J.R. (1988). Algae and human affairs. Cambridge, Cambridge University Press. Morrissey, J., Kraan, S. & Guiry, M.D. (2001). A guide to commercially important seaweeds on the Irish Coast. pp. 66. Bord Iascaigh Mhara, Dun Laoghaire. Ohno, M. & Largo, D.B. (1998). The seaweed resources of Japan. In Seaweed resources of the world. (Critchley, A. T., Ohno, M., Largo, D. B. & Gillespie, R. D., editors), 1-14. Japan International Cooperation Agency, Yokosuka, Japan. Stein, J.R. & Borden, C.A. (1984). Causative and beneficial algae in human disease conditions: a review. Phycologia, 23: 485-501. Tseng, C.K. (1981a). Marine phycoculture in China. Proceedings of the International Seaweed Symposium, 10: 124-152. Tseng, C.K. (1981b). Commercial cultivation. In The Biology of Seaweeds. (Lobban, C. S. & Wynne, M. J., editors), 680-725. Blackwell Scientific Publications, Oxford. Tseng, C.K. & Chang, C.F. (1983). Chinese seaweeds in herbal medicine. Proceedings of the International Seaweed Symposium, 11: 152-154. Tseng, C.K. (1984a). Common Seaweeds of China. Science Press, Beijing. Tseng, C.K. (1984b). Phycological research in the development of the Chinese seaweed industry. Hydrobiologia, 116/117: 7-18. Tseng, C.K. & Fei, X.G. (1987). Macroalgal commercialization in the Orient. Proceedings of the International Seaweed Symposium, 12: 167-172. Tseng, C.K. Liu, T.G. Jiang, B.Y. Zhang, Y.H. & Wu, C.Y. (1963). Study on the growth and development of Haidai (Laminaria japonica) transplanted at the Chekiang coast. Studia Marina Sinica, 3: 102-118. Site © M.D. Guiry 2000 - 2019. Important copyright notice: all text, design and photographs on this site are copyrighted by M.D. Guiry unless otherwise stated and all rights are strictly reserved. Click here for copyright information and contact. Website design: 249 Design Studio. Site maintained by M.D. Guiry (michael.guiry@nuigalway.ie). There have been 8724781 page loads since 1 January 2014 on 22 April 2019.